Guys, did I promise to blog once a week LAST month? I did indeed. And I have failed. I don't really have any excuses other than that life got in the way again, I haven't felt like writing (despite having a lot to write about), and just trying to keep a certain toddler constructively busy and not tearing down our house. I do have some upcoming things to share soon, such as new recipes, reviews of a few trips we've taken, a 2017 goal update, an Annabelle update, a new shop announcement (eek! ), and just some life lately posts. I've been super busy lately during Annabelle's nap time taking pictures of and listing her old clothes for sale. It's so sad when she outgrows pieces I've loved seeing her in. I am stashing away those really special pieces in the closet for now and will box them up when we move next, but it has felt really nice to sell a lot of her stuff. After all, we do need to keep buying her new, bigger clothes, so it's nice to recoup a bit of what we spent! We also finally went through a ton of baby stuff and ended up donating to a local women's shelter so much of what we no longer need: three breast pumps (two electric and one manual), a metric ton of breast pads, milk storage bags, bottles, bottle parts, and more. It feels great to have that all out of the house since we no longer need it - hopefully it can benefit some other new moms and families! It is slightly bittersweet, though, since I spent so much time with those dang pumps! BUT it feels great to know we won't be moving those across the country again! It's hard to believe she was ever so tiny! 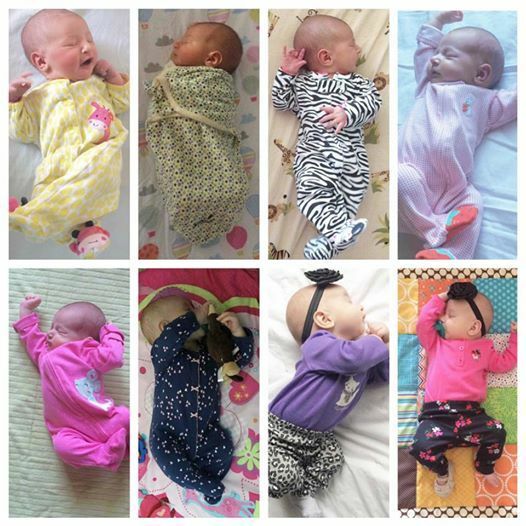 I ended up keeping a few of the outfits shown for myself because she was just so adorable in them, and I'm far more attached to her newborn stuff than the rest!